Continental Ranch Tucson is a Master Planned Community 25 miles Northwest of Tucson in the Town of Marana. 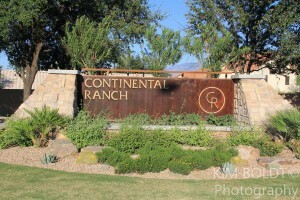 Continental Ranch is west of the I-10 freeway so homeowners have quick access to the City of Tucson. I-10 also makes travel to Phoenix very easy. Marana was once a quiet little town. But it has grown into a community of over 30,000 residents. Marana covers both sides of the I-10 freeway. The Master Planned Community of Gladden Farms is in the Town of Marana. The Active Adult Community of Heritage Highlands in Dove Mountain a few miles East of I-10. Continental Ranch and Marana are growing. Tucson Premium Outlets opened in 2015 with most named brand stores. New Home Construction is available in many of the neighborhoods. Continental Ranch Tucson homes tend to be contemporary in style. Buyer will also find Southwestern or Santa Fe style homes. Views of the Tucson Mountains are spectacular. Buyers will find home prices very attractive in this growing area. Located in Continental Ranch Tucson area is the retirement community Sunflower. Continental Ranch Tucson families are served by the Marana School District that includes Marana High School, Marana Middle School and Twin Peaks Elementary School. Dove Mountain, Rancho Vistoso and Gladden Farms are also master planned communities in Northwest Tucson. Luxury Homes in Marana are in the subdivisions of Canyon Pass and The Gallery. These subdivisions and the Retirement Community of Heritage Highlands are in Dove Mountain. Questions about the Tucson Real Estate Market or Continental Ranch Tucson Homes for Sale? Call Us 866 316 5575 OR complete the CONTACT FORM and we will get right back to you!